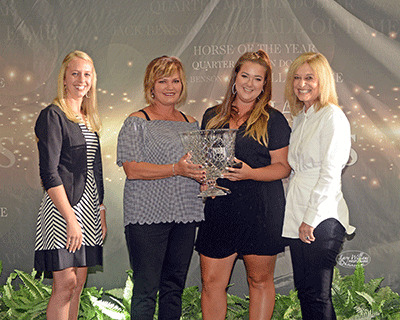 The National Snaffle Bit Association recognized its exhibitors, horses and owners for a job well done during the 2017 show season, as well as honored long-time members for their dedication, service and outstanding examples of the best within the equine industry. 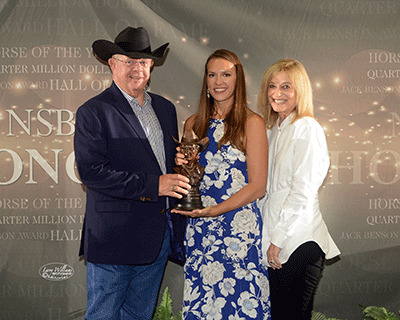 The awards banquet was held on Wednesday, August 15, at the Built Ford Tough Livestock Complex in Tulsa, Oklahoma..
NSBA Past President Bill Price, of Lebanon, Indiana, was named to the NSBA Hall of Fame in the Individual category. Although he became involved with horses later in his life, Bill had a fondness for them since his youth, and became a Palomino horse breeder. His involvement with the Palomino Horse Breeders Association eventually led him to the Color Breed Council, where he first met Leo Barbera at the PHBA Judges School. The education and credentialing of judges would become a passion for Bill, and he joined the NSBA Judges Committee in 1991. Bill would eventually work with NSBA’s breed affiliates, helped standardize rules for judging and adopting NSBA rules, as well as developing the agreements used to establish NSBA’s Alliance Partners. With service on nearly every NSBA committee as well as serving as a national director, secretary/treasurer, president-elect and president, Bill also served as a tri-chairman for the Breeders Championship Futurity when it started in 2002. Bill was also a founding member of the Indiana Snaffle Bit Association, NSBA’s first state affiliate. He was honored with the Jack Benson Award in 1995 and NSBA’s Lifetime Achievement Award in 2013. The late 1981 AQHA Stallion Dynamic Deluxe is the latest horse to be named to the NSBA Hall of Fame in the Breeding Horse category. By AQHA Hall of Fame sire Sonny Dee Bar and out of Boston Senora, Dynamic Deluxe had a show career that included 111 AQHA points and nearly $25,000 in NSBA earnings. Purchased by Stephen Stephens and Cindy Stephens-McCraw in 1989, Dynamic Deluxe would stand in the Pacific Northwest and be promoted tirelessly by his owners. The stallion’s offspring have earned 29,521.5 AQHA points, $444,322.97 in AQHA Incentive Fund earnings and $185,327.19 in NSBA earnings. 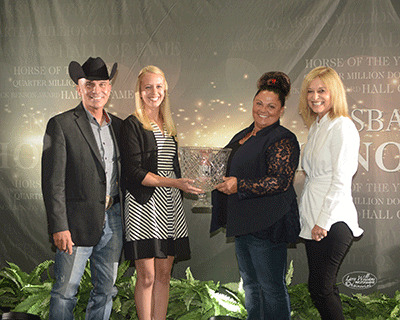 One of the most decorated show horses in NSBA and AQHA history, the 2003 AQHA gelding A Certain Vino was inducted into the NSBA Hall of Fame in the Show Horse category. Much like a fine wine, Vino just seemed to get better with time. Bred by Tim and Lou Petty, Vino is by Certain Potential, whose foals have earned more than 29,000 AQHA points and earned more than $2.2 million in total earnings. His dam, Dotevita, is also in the NSBA Hall of Fame. All told, Vino earned 1,568 AQHA points, 15 AQHA world championships and five reserve titles, eight AQHA Superior performance awards, three AQHA Championship awards, 18 All Around and nine reserve All Arounds and $249,016.54 in NSBA earnings. He was named NSBA’s Horse of the Year in 2008. The National Snaffle Bit Association is pleased to announce that the President’s Award has been renamed the Leo Barbera President’s Award, in honor of the association’s first president, Leo Barbera. Beginning with his roots as a horseman in Ohio, Leo Barbera proved to be in the right place at the right time in the horse industry on numerous occasions. He was recruited from the garage of his boss, Harry Polen, in Ohio to train and show horses and proved to have a knack for bringing out the best in both the horses and the people who surrounded him. He would go on to train and show horses for a number of successful owners including Bob Evans Farms, owned by the famous restauranteur. The gregarious cowboy never met a stranger, so it came as no surprise at the 1983 All American Quarter Horse Congress that Leo was able to persuade a number of horsemen to pull together to donate the start-up funds for the creation of the NSBA in exchange for becoming charter members of the group. Leo, along with Walter Hughes, Jerry Stanford and Jack Benson, had a vision to create an association promoting kinder, gentler training methods, with a goal of longevity in show horses and a set of uniform rules by which to judge them. It seems fitting that the 2018 recipient of the NSBA Leo Barbera President’s Award, recently named after NSBA’s first President, Leo Barbera, is an Ohio product. Just like Leo Barbera himself, the All American Quarter Horse Congress is native to Ohio. 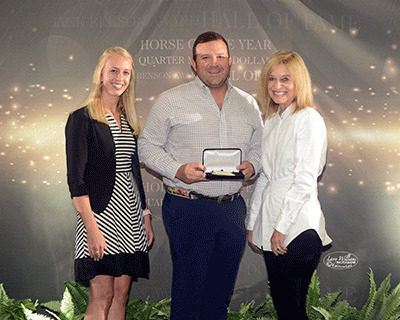 Like Leo, the All American Quarter Horse Congress has been innovative and forward thinking, with its impact reaching far beyond Ohio state lines. 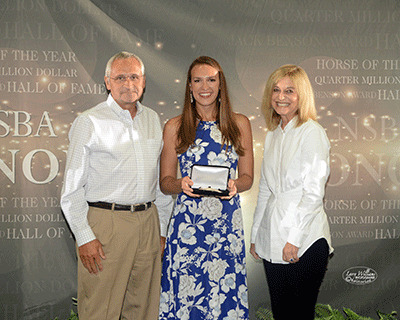 The All American Quarter Horse Congress, now in its 52nd year, has long been a friend and supporter of the National Snaffle Bit Association. Working relationships between officer and directors serving for both Ohio Quarter Horse Association and NSBA over the years produced many joint activities and joint successes. The All American Quarter Horse Congress hosted the first of many official NSBA sanctioned classes to be added to it's show in 1984. The Congress was also one of the first shows in the country to adopt NSBA’s Dual Approved classes. In 2003, the Congress offered 12 NSBA Dual-Approved classes in Junior, Senior, Amateur and Youth Western Pleasure and Hunter Under Saddle events. The show continued to add Dual Approval for other NSBA classes over the next several years, including Trail and Western Riding classes in 2006. When NSBA began its own futurity, the Breeders Championship Futurity (BCF), its first classes were held in 2001 at the All American Quarter Horse Congress. To get the program started, two classes – an English Longe Line and Western Longe Line, with Open and Non-Pro divisions, were held. In 2015, in the spirit of NSBA’s all-breed futurities, the Congress made its Western Pleasure and Hunter Under Saddle futurity and stakes classes open to several breed associations and registries, including the American Quarter Horse Association, American Paint Horse Association, Appaloosa Horse Club, American Buckskin Registry Association, International Buckskin Horse Association, Palomino Horse Breeders of America and the Jockey Club. 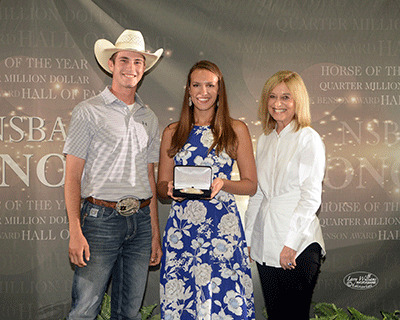 Through a variety of programs, the National Snaffle Bit Association and the All American Quarter Horse Congress work together to bring value to exhibitors and owners alike. NSBA’s Smart Points program became the sponsor of the Congress National Youth Activity Team Tournament in 2010. NSBA also provides the iconic NSBA bronze trophy to the winning exhibitor in each Dual-Approved class as well as to the winning NYATT team. “Perhaps the best example of the Congress and NSBA’s successful partnership stems from the addition of NSBA’s Equestrians With Disabilities classes to the 2015 All American Quarter Horse Congress. Following the success of the Equestrians With Disabilities classes at the Congress, the show added Heroes On Horses classes to the slate in 2016 for both independent and supported riders. The Congress has also graciously allowed NSBA to recognize milestone achievements before the Congress show audiences in the past several years. NSBA crowned its first two Million Dollar Riders, Gil Galyean and Rusty Green, when each reached the milestone on earnings won during the show, as well as honored NSBA’s most recent Quarter Million Dollar Rider, Deanna Searles, when her win in the 2017 Congress Masters Hunter Under Saddle Futurity edged her over the top of the quarter million dollar mark. 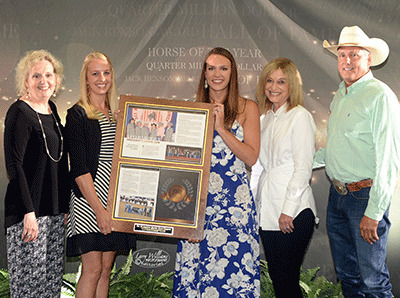 NSBA is pleased to recognize the many ways in which the All American Quarter Horse Congress has provided its cooperation, support and a premier venue in which to celebrate the horses, exhibitors and owners of NSBA. 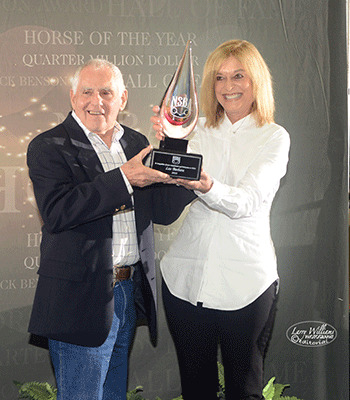 Named for the late Jack Benson, the award is given annually to an individual who unselfishly gives his or her time to promote NSBA and its mission and create a greater interest in the pleasure horse industry. The Jack Benson Award has been presented annually since 1989. Allen Mitchels was recognized as the recipient of the 2018 Jack Benson Award. With a love of horses that runs deep in his family’s roots, Allen has a love for the entire horse industry, where he has served as a trainer, judge, breeder and instructor who has been involved with NCHA, NRHA, NRCHA, AQHA and NSBA. He served as NSBA president in 2015-2016. With a special passion for judging and education of judges, Allen became a frequent presenter at the Color Breed Council’s judge’s seminar. Soon he was approached by Gary Trubee, Jim Dudley and Bill Price, as the group looked for ways that the scored class criteria Allen discussed could be applied to judging rail classes. As part of NSBA’s Judges Committee, Allen took on the task of defining the hierarchy of judging Western Pleasure and developed the language in the NSBA Rule Book with David Dellin. Allen also aided with a series of articles called “The Judges Corner” that were published in The Way To Go. Allen was also influential in the development of the NSBA Markel Insurance Breeders Championship Futurity Yearling Sale be coalescing a number of ideas from NSBA members into an exciting and successful program that is now in its sixth year. 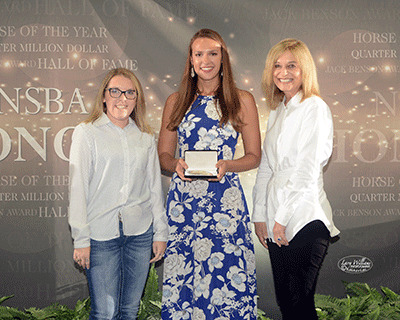 Deanna Searles, of Scottsdale, Arizona, has become the newest member of NSBA’s Quarter Million Dollar Club, crossing the $250,000 level in lifetime NSBA earnings. She accomplished this milestone at the 2017 All American Quarter Horse Congress when she won the Masters Hunter Under Saddle Futurity. With her husband, Jim, Deanna operates Circle S Ranch in Scottsdale. 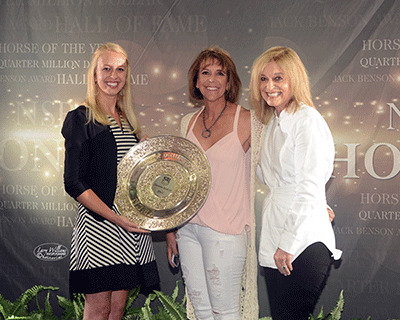 She has earned AQHA and NSBA world championship titles as well as the AQHA Superhorse award with Another Valentino. She won the 2011 Congress Masters Hunter Under Saddle Futurity aboard Lastcallfour Alcohol, and repeated the win in the same class in 2017 with a full sibling, Best Jazz Album Yet. Deanna won her first world championship in Senior Trail at the 2017 AQHA World Championship Show aboard Suddenly A Good Bar. Some of the legendary horses that have come through the Circle S barn include Flashy Attraction, Lopin For A Chex, Majestic Scotch, Al Be Sweet On You, Lyles Al Lie, Blameitonthe Alcochol, More Radical, Heza Radical Zip, She Says Aloha, I Gotta Good Name, Just Burning Money and Ona Good Kiss. 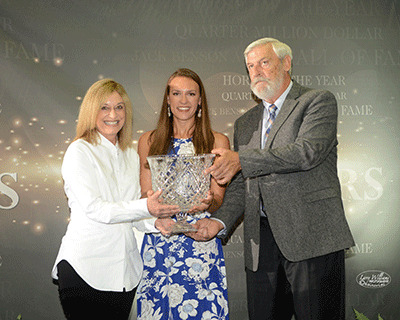 Deanna was inducted into the Arizona Quarter Horse Association Hall of Fame in 2009/2010 and was named AQHA’s Professional Horsewoman of the Year in 2013. 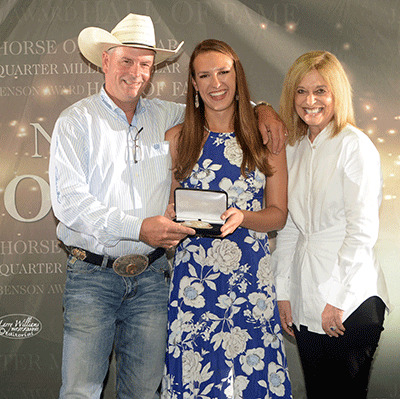 The 2014 AQHA gelding Made N The Shade was recognized as NSBA’s 2017 Horse of the Year. Owned by Tommy and Natasha Blanchard of Lumberton, Texas, Made N The Shade is by Machine Made and out of Mistys Version (by Good Version). 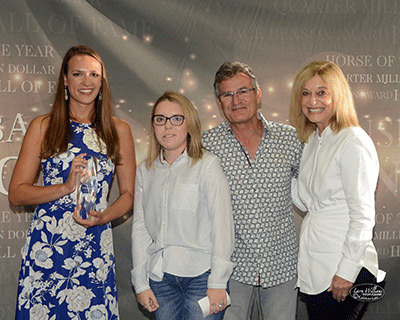 Katie Green picked out the gelding at the 2016 All American Quarter Horse Congress and persuaded a reluctant Tommy Blanchard to purchase the horse for his daughter. Just one month later, Andy Cochran showed ‘Mikey’ to win a world championship title in the Two Year Old Snaffle Bit Western Pleasure at the AQHA World Championship Show. In 2017 with Natasha and Rusty Green at the reins, Mikey would earn $40,560.99 in NSBA competition, with championship rides throughout the year including the Madness, Tom Powers Triple Challenge, Premier Quarter Sires, Show For Dough, NSBA Breeders Championship Futurity, NSBA World Championship Show, All American Quarter Horse Congress and the AQHA World Championship Show. Complete point standings from the 2017 show year can be downloaded at www.nsba,com.